For a long time, SouthPark was known as an upscale, suburban, rather homogenous and boring neighborhood. As were its dining options: steak, steak and more steak. Grilled chicken on salads, maybe with some hearts of palm or mandarin oranges, if the chef was feeling wild. Grilled salmon. And "gourmet" hamburgers. Vegan or vegetarian? If you lived in SouthPark and wanted to dine out, you'd drive to the Park Road or Plaza-Midwood areas. SouthPark restaurants typically had zero veg options — indeed, a SouthPark restaurant's claim to fame was often based on the foie gras they served. And ethnic? Bao Ding, a fairly traditional Chinese restaurant in a modern setting, was about as ethnic and edgy as SouthPark got. But times have changed. SouthPark, while still upscale, has gotten more diverse. There are more nationalities, more ethnicities. The recent influx of townhouses and condos has made it attractive for younger singles or couples. And, being a major business hub, it pulls in all ages and income levels during daylight hours. And slowly, the dining options have started to reflect that. Perhaps it started with the chains. Brixx Foxcroft does a brisk business selling vegan pizzas (in addition to meat pizzas with extra cheese). Moe's at Sharon Corners and Chipotle at the mall sell vegan bean burritos and bowls. Zoe's sells a version of fast-casual Mediterranean with many veg options, but no falafel or babaganoush. More recently, there's Living Kitchen, a raw vegan restaurant and juice bar which ironically occupies the space recently vacated by the foie gras-loving Zebra. And now there's Yafo Kitchen, which opened in June 2016 and has attracted an almost cult-like following. Frank Scibelli (who also owns Midwood Smokehouse and Mama Ricotta's) told Charlotte Business Journal in May, "It seems to have a following like nothing I have ever done." This could be because it flips the SouthPark restaurant stereotype on its head. Instead of a meat-based restaurant where you have to seek out the one veg option, Yafo is basically a vegan/vegetarian restaurant where the chefs will drop in some meat — spiced chicken, spiced beef, beef koftas (think spicy meatball) or lamb — for the omnivores. Of course, the big question for any Mediterranean restaurant is: Is it authentic? The answer, surprisingly, is yes. That's largely due to executive chef Shia Fargian, who is from Israel and imports the spices Yafo Kitchen uses from a market in Tel Aviv. And everything except the cheese is made from scratch. "These are largely the foods I grew up eating, that I learned to cook in Israel," Shia says. "Customers from the Middle East will dine here and say, 'This tastes like home.'" 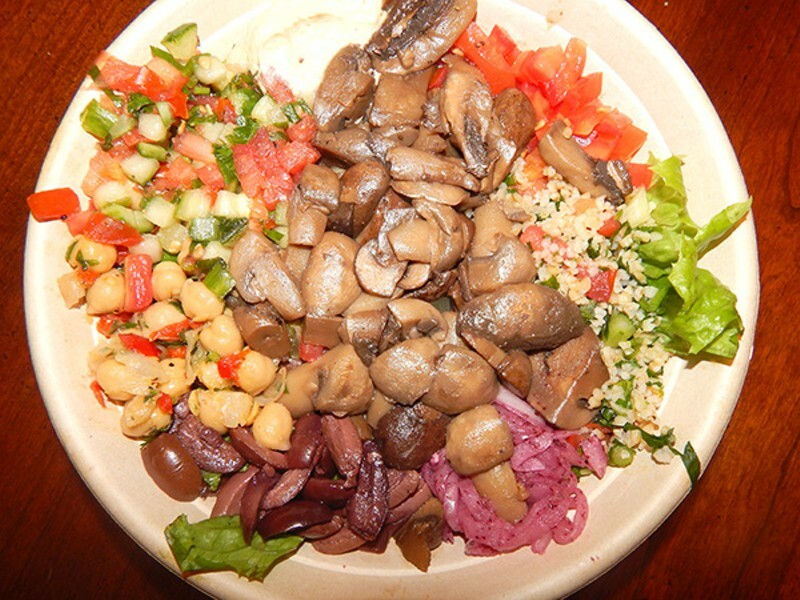 When you walk into Yafo Kitchen for the first time, you may feel you have mistakenly walked into a Chipotle's. It's bright and cheerful and colorful; the seating and tables are spare; there's a cafeteria-like line where people are not just ordering mezze platters but putting together salad, grain or hummus bowls. In my new role as Creative Loafing's vegan reporter, I've become very chatty with strangers. I soon find out that everyone in our call ahead/order online group are repeat customers. Cynthia, a well-groomed, expensive smelling woman who lives on Giverny Drive, is picking up hummus and babaganoush for her book club meeting that evening. "It's so much better than what the supermarket sells," she tells me. Gene, an African-American with long braids who lives in nearby condos, says he's there for the vegan options. Hummus: Made from organic chickpeas, this hummus is exceptionally creamy and not too oily. (They will drizzle your portion in olive oil but you can request otherwise.) Tip: If you want more flavor, mix it with one of the dressings – Amba (pickled mangos), Greek (red wine and oregano), or Schug (traditional Yemeni hot sauce, not nearly as spicy as they warn you). Babaganoush: Ok, you know how sometimes you order hummus and babaganoush, and then you're not sure which one is which, because they both taste like tahini? You won't have that problem here. The babaganoush is exceptional, maybe the best I've had in Charlotte. You can taste the eggplant as well as see some tiny seeds. And unlike some restaurants where you're pretty sure they just added some smoked paprika or liquid smoke, this babaganoush has an authentic, charred, smoky flavor. Falafel: Another winner. Not too dry, with the green interior from herbs falafel should have! These are served with tahini; I like to mix the tahini with Schug. 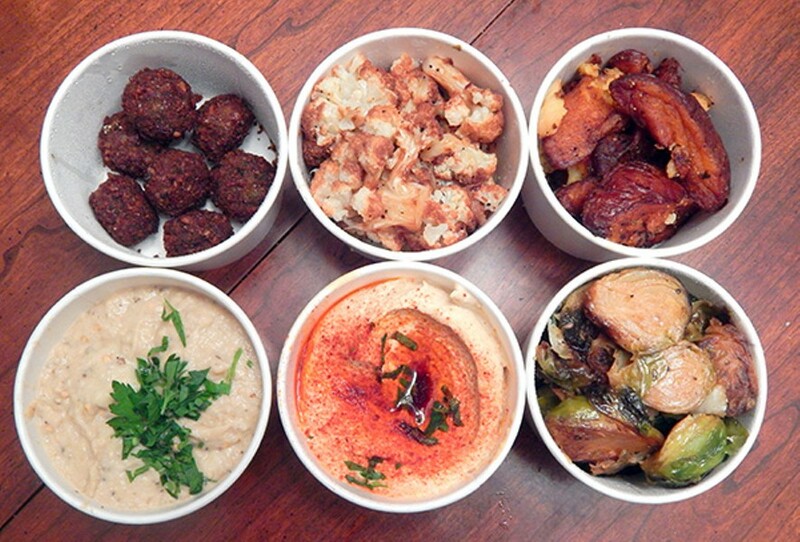 My only complaint is that the falafels are quite small, and if you order mezze you only receive about half a container. Order double if you plan to share. Laffah: Yafo Kitchen has laffah bread instead of pita bread. Laffah is softer and stretchier than pita bread — think of a light, stretchy naan. Tabbouleh: This is Americanized — mostly bulger with a few random green shreds of unidentified herbs. I prefer a traditional tabbouleh of mostly parsley and mint — the kind that makes your mouth seem zingy and fresh even though you also just ate a ton of garlic. Hot Sauce: Points taken off for the lack of a good hot sauce. Yafo does have schug, a blend of peppers and herbs. Perhaps it's hot enough for omnivores, but for vegans who appreciate Indian and Thai food – or who are used to traditional spicy sauces in their falafel wraps - it's going to seem mild. Tasty, though, especially mixed with tahini. Yafo sells a number of non-traditional mezze items (at least, I don't think they are traditional). I asked a line server what the most popular mezze item was (outside of hummus, falafel, and babaganoush). The young man gave me a plaintive look. "Brussel sprouts," he whispered. Yeah, I don't get the Roasted Brussel Sprouts either, but it is popular. So, too, is the Crispy Cauliflower (which I have found to be tasty but never actually crispy). 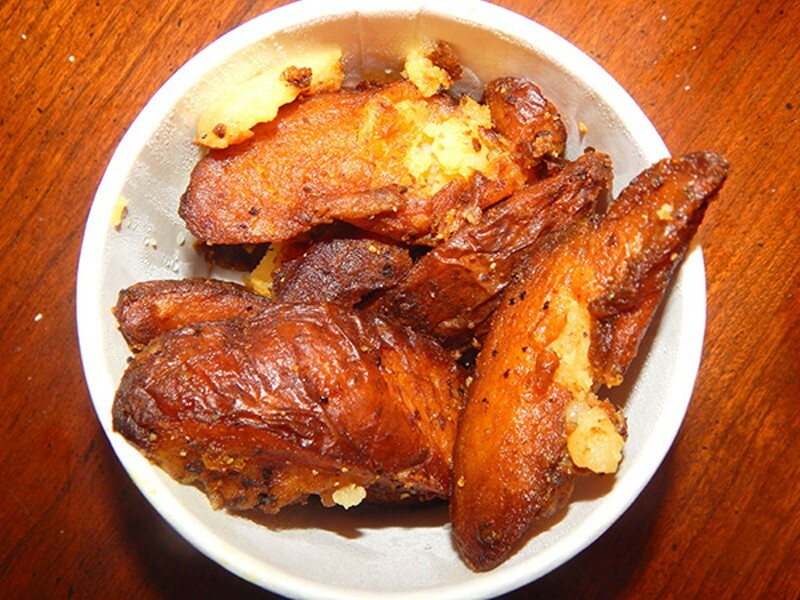 Rotisserie Potatoes are also popular and a safe choice if you're unsure about Mediterranean food. Try them with a little tahini. Be aware all three can be a tad oily. Not good, not bad, these options (mostly for bowls) are just. . . meh. Roasted mushrooms (tastes a bit canned even though they're not), cucumber-tomato salad, pickled cucumber, chickpea and roasted pepper salad, microscopically diced tomato, sumac onions (pickled onions are always good, I just couldn't taste the sumac). Beets with Goat Cheese and Pistachios and Greek Yogurt Mac and Cheese win raves with vegetarians and omnivores; obviously I've not tried them myself. Now let's talk about the "build your own bowl" concept, which should be familiar to anyone who has ever been to a Moe's or a Chipotle. You can choose a green (romaine, spinach, spring mix or kale), a grain (cumin rice or "seasonal" grain), or a hummus bowl with laffah. Next, pick a spread (hummus, babaganoush, or tzatzikim, but take note: the tzatziki has yogurt so it's veg, not vegan. Then, choose from a number of free toppings, several premium toppings for 99 cents (avocado, cage-free eggs), $2-$4 proteins (from falafel to lamb), and dressings. I noticed while most of us in the pickup queue had ordered mezze, bowls and wraps seemed to be the most popular dine-in choices. For beverages, skip the soft drinks and have organic sweet or unsweet tea, hibiscus tea, or cucumber lime mint juice. 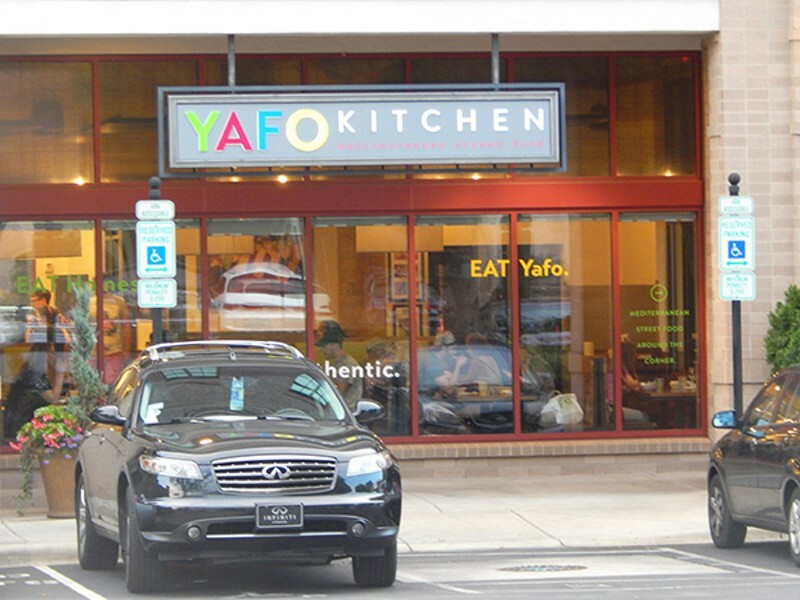 Yafo Kitchen has proven so popular in such an unlikely location as SouthPark that Frank Scibelli is opening another restaurant in Plaza Midwood in Spring 2018. The restaurant will be located in the One305 development at the corner of Central and Clement avenues. It will be interesing to see if the menu changes in his heavily vegan/vegetarian neck of the Charlotte woods. Catherine Brown is a native Charlottean (yes, they exist) and vegan foodie (no, vegan and foodie are not mutually exclusive). Find out more about being vegan in Charlotte at her blog vegcharlottenc.com.